At a PLAN-Boulder County forum on Friday, October 19, Jonathan Koehn, Regional Sustainability Coordinator for the City of Boulder, asserted that the Climate Action Plan (CAP) tax has allowed Boulder to avoid increased greenhouse gas (GHG) emissions better than other American cities with GHG goals, and has been judged cost-effective by two independent research organizations that have examined it. The CAP tax was passed by an overwhelming majority of the city’s electorate in 2006. In approving it, Boulder became the first city in the nation to tax its own energy use to reduce GHG emissions and address the impact of human activity on climate change. The tax is imposed on electricity consumption and costs the average residential customer about $21 a year. It initially generated $600,000 a year, which jumped to $1.8 million a year when the City Council subsequently decided to raise the rates to the maximum authorized by the voters. Issue 2A on this year’s ballot would extend the CAP tax for another five years until March of 2018 (since collection of the current tax actually started in March of 2008). PLAN-Boulder County, along with the Sierra Club, the Boulder Chamber, and other organizations, has endorsed the proposed extension. The goal of the CAP is to reduce by 2012 the city’s GHG emissions seven percent below their level in 1990, which is the same as the Kyoto Protocol’s goal for the entire world. Koehn readily conceded that Boulder has not reached its target. 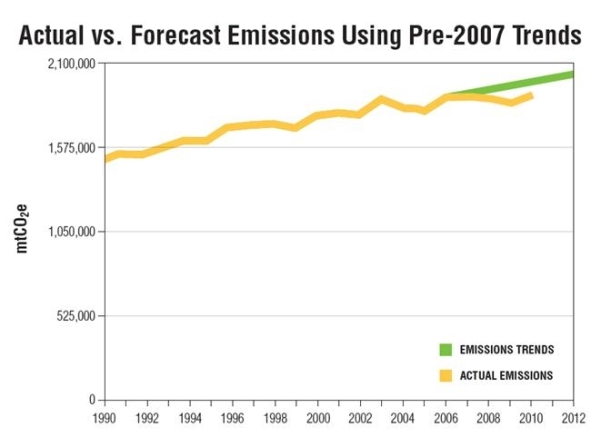 In fact, GHG’s have increased in Boulder since the CAP started in 2006, as they had between 1990 (and before) and 2006. However, Koehn maintained that without the CAP the city’s GHG emissions would have been 4.5 percent higher in 2010 than they actually were. Because the rate of growth was diminished, nearly 85,000 metric tons of carbon dioxide was avoided in 2010, he claimed. Koehn also noted that GHG emissions in Boulder were slightly lower in 2010 on a per capita basis than they were in 2007. Koehn stated that most of the increase in GHG emissions in Boulder is attributable to expanded industrial and commercial activity. He pointed out that 59.6 percent of GHG emissions in Boulder are caused by electricity generation, 16.7 percent by natural gas, 26.3 percent by vehicle fuel, and 2.5 percent by landfill gas. Although Koehn did not explain the hoped-for effects of municipalizing the city’s electrical distribution system, the proponents of municipalization expect that it will enable Boulder to dramatically lower its GHG emissions by substituting much higher levels of renewable energy for fossil fuels to generate electricity. Koehn did comment that Xcel is one of the most carbon-intensive electricity producers in the United States. Forum audience member Crystal Gray pointed out that the University of Colorado has suspended its co-generation facility for renovation and that its absence had forced the University to buy much more electricity from Xcel. However, CU plans to resume operating the co-generation plant soon, which action will have a dampening effect on GHG emissions. Koehn observed that CU has spent $90 million revamping the co-generation equipment. He also noted that at times CU accounts for a quarter of Boulder’s energy usage. Koehn remarked that the CAP tax was never intended to achieve the CAP goal on its own. He said that $64 million in private-sector investment would be required to meet the target. Koehn said that Boulder’s software for counting GHG emissions had been custom-made, which is unusual for municipalities. However, he admitted that it does not include many external sources of GHG emissions, such as air travel by residents and the carbon needed to manufacture products used by residents. The exception is that commuting emissions to and from Boulder are accounted for. Koehn explained that the guiding principles of the CAP are: reduce use, build better, ramp up renewables, travel wise, waste not, and grow green. He said its main programs have been “EnergySmart,” now operated in conjunction with Boulder County, which promotes energy efficiency improvements in residential and commercial properties; “Smart Regs,” which requires that residential rental properties in the city (which constitute over half of its housing units) meet an energy efficiency standard by 2019; and “10 for Change,” which encourages Boulder businesses to reduce their energy use and waste by at least ten percent. Koehn reported that the CAP program has been examined by the Rocky Mountain Institute (“RMI”) here in Boulder and the Brendel Group from Fort Collins. He stated that RMI concluded that the city is reducing GHG emissions at a reasonable cost and determined that the Energy Smart program has been particularly effective in doing so. RMI also declared that the benefits of the CAP will compound in the future. The Brendel Group also found that the CAP is cost-effective. It recommended that the CAP enhance its residential programs, stimulate market innovation, and improve tracking, reporting and evaluation. Koehn said that if the CAP tax is extended, the city will try to stimulate market innovation by offering up to $350,000 in awards for innovations. He also said that tracking, reporting and evaluation have been hampered in the past by a lack of detailed information from Xcel. He observed that the utility had only disclosed aggregate, yearly sales reports to the city, but that it is trying to compel the release of more data through actions before the Public Utilities Commission. Koehn also asserted that the CAP staff is working to infuse CAP principles everywhere in the city governmental organization and embed them in the transportation master plan, waste disposal master plan, planning department procedures, the attitudes of City Council and boards and commissions, and in other areas. However, audience member and Planning Board member Leonard May expressed doubt that a commitment to reducing energy usage and waste had really penetrating the thinking of the Planning Board or the City Council. In response, Koehn claimed that at least the city’s planning staff had thoroughly embraced this ethic, although May did not seem convinced. While I would like to believe that the Carbon tax will decrease consumption, I do not see anywhere in this article that describes the causal mechanism between the reduction in growth of GHGs and the carbon tax. In the years 2007 – 2010 there was a fairly substantial economic downturn as was witnessed locally in reduced tax revenues. Without seeing the RMI report and others, I am not sure if we can clearly attribute the reduction in growth of GHGs to the tax. It would be good to find another “boulder like community” without the tax for comparison’s sake. Additionally, the $20 average yearly tax is not nearly enough of an incentive to change behavior. Ideally, we’d have time of use fees that are more like to affect behavior. How far off are we from being on the right path to meeting Kyoto? If we are reducing growth rates – doesn’t seem like we’re heading in the right direction yet.